Join the discussion on our forums! Come discuss Militia Commander over in our dedicated Militia Commander discussion topic. Battlecry: Gain +3_Attack this turn. She only needs two commands: "Heel" and "Sic 'em!" With the new weapon revealed if there was another decent 3-cost rush card (a vanilla 2/4 rush would do), then I can see this card being a staple in the Tempo Rush Warrior deck. Really this card wasn't that far off from viability before the weapon, but now with the weapon the high-roll potential is there so it's worth it to sometimes play a slightly below-curve card and sometimes play a huge tempo-swing card. Darius is just a 5 mana 4/4 rush minion which means a overcosted 5 mana 4 damage damage spell that might leave a slightly stronger body(which gets remove the next turn) if the enemy minion has less than 4 attack , if not it is 5 mana 4 damage spell worse than (WANTED!). 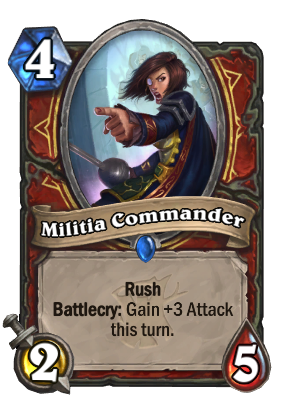 On the other hand militia commander deals 5 damage as a 4 mana minion which is already fair enough for its cost and on top of that it leaves a 2/x body on board. Turn 4: you play Militia Commander and remove the Tar Creeper. After your turn you're left with a 2/2. It's definitely good, but I struggle to see it's potential in constructed. I definitely see it getting drafted in arena because of the tempo, but I'm not sure it'll fit into a constructed deck. Time (and more revealed cards) will tell. Tempo Warrior needs a comeback. I think this is better than Kor'kron Elite in a Tempo warrior deck (if there is to be one and I, for one, hope so). It kills most 3 drops and survives. It may not be good enough to make it into a meta deck (it's pretty good, but is a stand-alone good kind of card), but I guarantee this card will be a big pick up in arena. It screams big Tempo Swing. I smell tempo warrior being tier 2 in wild. Easy 1 for 2 versus faster deck at turn 4 for CW. Very solid card. Suppose this kills a 3-Attack minion on average. That makes this a 4 Mana Bomb Squad with no negative Deathrattle. Not too shabby. Would love to see a Midrange Warrior come out from this expansion. This is a very powerful card that technically activates as an injured minion on the turn its played (if it survives) while wiping out a 5 health minion on turn 4. A strong balanced card. Obviously really good in Arena. That's cool that they are finally trying to implement instant minion removal without making us worry about our faces. I wonder if we see any charge minion this set. Hopefully not. What if you evolve into this card. Does it get the rush effect? Seems like a great card for Arena. Congratulations Militia Commander, you debuted one of the new keywords. Your job here is done.